A vehicle that by day runs around a town or city transporting passengers to and from work or to the shops. Then, in the evening and during the night, when most people are at home watching TV or in bed, that same vehicle takes on a completely different role as a delivery van, transporting goods to shops ready for the next morning’s trade. Oh, and this vehicle is fully electric – and self driving. 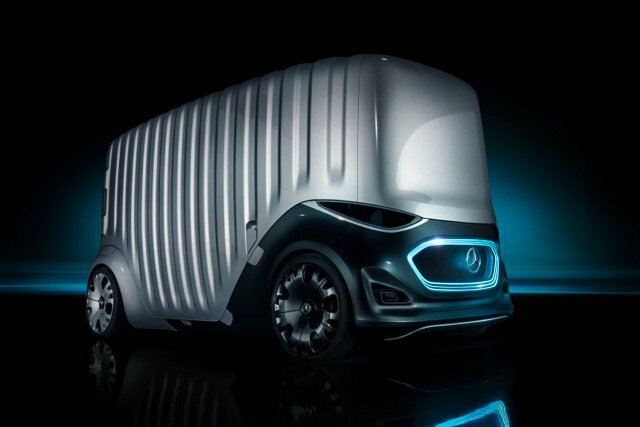 That’s Mercedes-Benz Vans’ vision of the future, encapsulated in a concept vehicle unveiled in Copenhagen, Denmark this week, and which is certain to be the centre of attention at next week’s IAA Commercial Vehicle Show in Hannover, Germany. Dubbed Vision URBANETIC, it aims to eliminate the separation between people moving and goods transport courtesy of a self-driving electrically powered chassis which can take different switchable bodies that can be interchanged in a matter of minutes. For ride-sharing transport there’s a twelve passenger module, while a cargo module can carry up to ten pallets, with load space maximised as there is no need for space for a driver. While Mercedes-Benz Vans is making no predictions as to when we are likely to see such vehicles on our roads, it envisages Vision URBANETIC operating in a fully networked environment where evaluation of local information will be taken into account. For example, if there is a sporting event on with a large group of people needing to travel at the same time, the vehicle control centre that manages these autonomous vehicles can identity this in advance, and send additional units to meet that demand.